Examine George Washington's final 36 hours and the events that followed his death during this 90-minute tour. Explore the events leading up to Washington’s death and learn about the people who played a key part in trying to keep Washington alive. Listen to Dr. James Craik, Washington's physician and friend for 40 years, share his role in the attempts to cure Washington. After viewing Washington’s deathbed in the Mansion, look inside the Old Tomb where Washington was originally interred in 1799. The tour will conclude with a wreathlaying to honor our nation's first president at his final resting place. Despite the great attention and care of his attending physicians Washington died on December 14, 1799. 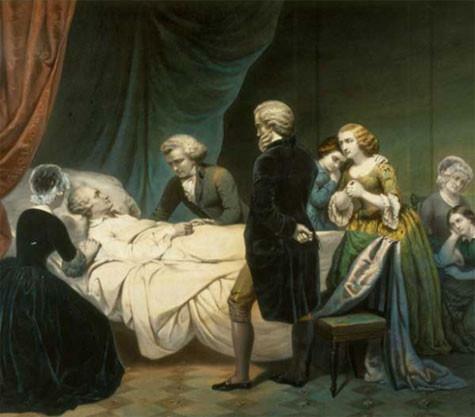 Learn more about the causes and circumstances of George Washington's passing. Visit the final resting place of George and Martha Washington.